This is a mosaic of Olympus Mons, the highest volcano on Mars, which towers 26 km above the surrounding plains. 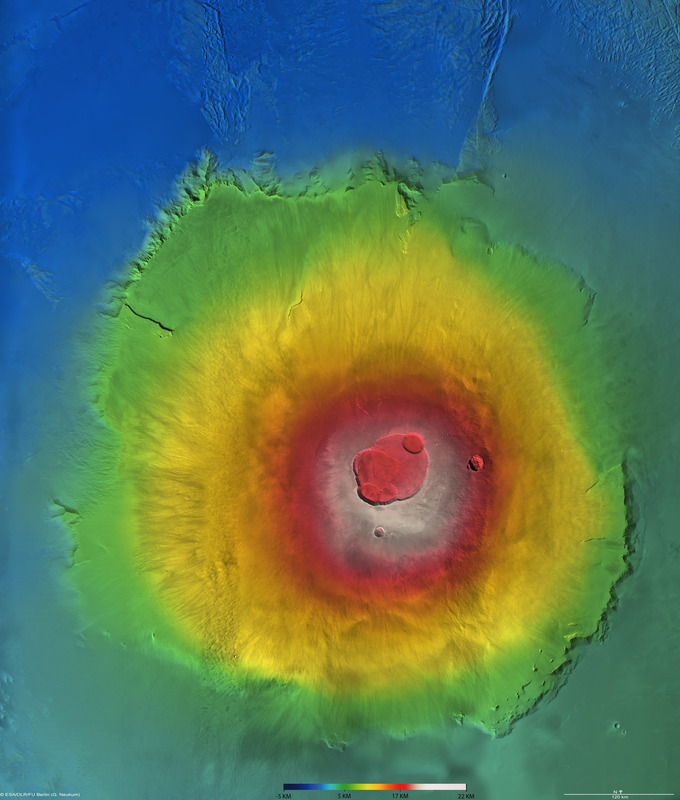 The image covers an area of approximately 600 000 square kilometres and is colour-coded according to height based on data from the Digital Terrain Model (DTM). The High Resolution Stereo Camera (HRSC) on board ESA's Mars Express orbiter imaged the region over 18 orbits. This image is an ortho-image mosaic, where the projecting rays are perpendicular to the plane of projection. This corrects any deformations introduced by an imaging camera. Such an image can be fitted directly on to a map. From the observations, 16 HRSC orbit strips, with around 35 Gigabytes of data were used to generate a Digital Terrain Model (DTM) mosaic and an ortho-image mosaic. The DTM mosaic has a resolution of 150 m/pixel. The resolution of individual nadir images (taken by pointing the camera vertically down to the surface) is in the range of 12 to 40 m/pixel. Individual terrain models with a resolution of up to 50 m were derived for every HRSC image strip. The high-resolution DTMs and ortho-images are derived through a complex process. Matching surface features were used to 'stitch' the images strips together, and complex geometrical calculations were used to produce the 3D coordinates of all measured points in the area.